A fusion of sound, texture, warmth and tranquility, brought into balance by the power and beauty of the Canadian Rockies, Silver Creek Lodge is Canmore’s premier resort hotel. A fully selfcatering luxury hotel in the heart of Canmore… this is hotel accommodations unlike any other. Inspired by Zen tradition, to bring attention, reverence and harmony to all things, Silver Creek Lodge offers a unique environment with all the comforts of a cosmopolitan lifestyle in luxurious and unique condo suites. 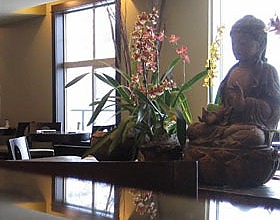 The wonderful Bodhi Tree Spa offers an unforgettable spa experience, the height of relation… while the Wild Orchid Asian Bistro serves delightful Asian fusion cuisine. The Wild Orchid Asian Bistro is a unique restaurant offering a delightful mix of sushi and other Asian dishes with a stylish Western flair. Silver Creek Lodge is the ideal location to celebrate your next group event. Whether you’re planning a corporate retreat, ski trip, family reunion, wedding, or any other type of group event, our staff will carefully ensure that all your needs are taken care of. We will be more than happy to help you with all your group event planning needs as well as ensuring your hotel stay is a positive one. Our boardroom can accommodate up to 18 people. The Wild Orchid hold 45 people inside the restaurant and another 15 on its beautiful patio. Group rates are available upon request. The Bodhi Tree Spa offers impeccable and customized treatments by knowledgeable and professional staff using indigenous plant and flower essences and practices from around the world. 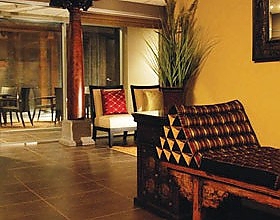 Savour the essence of Asia’s rich culture while relaxing in a eucalyptus steam room or in 1 of 3 open air hot pools. The spa features 2 couples rooms for those who would like to enjoy a service together. Our eco-concious spa will provide nurturing care for those looking to escape and leave the world behind.